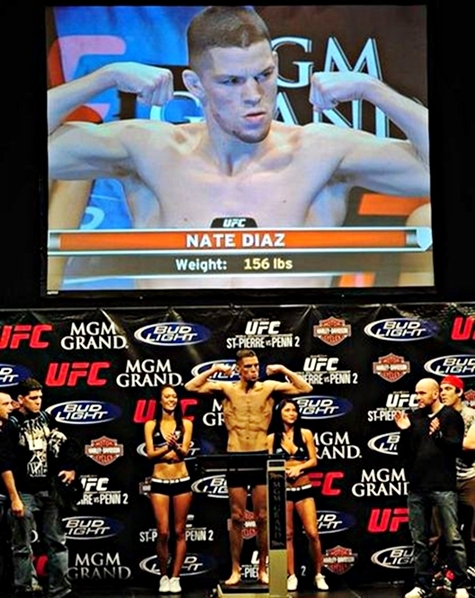 The upcoming UFC on FOX event, headlines a lightweight bout between Nate Diaz and Jim Miller. The official weigh-ins for “UFC on FOX: Diaz vs. Miller” event took place this afternoon, at the at the IZOD Center in East Rutherford, New Jersey. The same venue for tomorrow’s event. Out of all the fighters who weighed in, only preliminary card fighter John Lineker did not make weight for his bout. Lineker was a pound overweight for his flyweight bout, coming at 127 lbs, not meeting the 126 lbs weight limit. As a fine, a portion of his purse will go to his opponent, Louis Gaudinot. Event Card for "UFC on FOX: Diaz vs. Miller"